The Tigers rallied from an early three-run deficit, taking the lead on a two-run homer by Jarrod Saltalamacchia in the sixth inning, to beat the Astros, 5-3, and give Justin Verlander his first win of the season on Saturday night at Minute Maid Park. Astros outfielder George Springer (3-for-4) followed a leadoff single by Jose Altuve in the first inning with a line-drive home run off the left-field foul pole. Verlander (1-1) struck out the next two batters before Tyler White took him deep with a solo shot into the Crawford Boxes in left for a 3-0 lead, but the Tigers chipped away. "They had guys on base the whole game," Astros manager A.J. Hinch said. "What was it? 15 hits, 10 or 11 left on base -- just traffic all over the place, and they never let up. They had four innings where they scored. We scored one. Unless you put a big number up, if you get outscored in innings, 4-1, it's probably not going to end up in your favor." 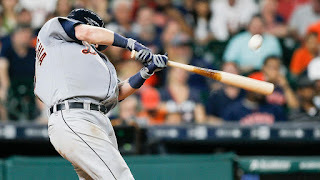 The Tigers scored once in the second and again in the fifth before taking a 4-3 lead in the sixth when Saltalamacchia clanked a two-run homer off the right-field foul pole against Astros starter Collin McHugh (1-2), who gave up four runs and 10 hits in 5 1/3 innings. Verlander allowed three runs and seven hits with eight strikeouts in six innings. "Getting down, 3-0, and coming back like that was a good comeback," Detroit manager Brad Ausmus said. "We had nine innings to do it, but still. You're down, 3-0, and you're on the road, it's not easy to do." Springer comes around: Springer, who was in a 1-for-11 slump going into the game, came through with his first three-hit game of the season to provide a spark in the No. 2 hole in the batting order. After his first-inning homer, Springer singled to left field in the third and singled to center field in the fifth inning. Off the mat: Verlander never had his best stuff, but he was exactly what the Tigers needed after a brutal first inning. The pair of homers put Detroit in a hole and indicated that Verlander's seven-run struggle in Pittsburgh may not have been a fluke. Instead he allowed just one runner past first base the rest of the way and struck out eight to keep Houston's early lead manageable. "With our offense, I give up three early, but you still know if you settle down, it gives us a chance to win," Verlander said. "That was my main focus. ... I was able to make pitches the rest of the night and pitch pretty well." The Tigers turned two double plays, and they've now facilitated double plays in nine straight games. That's the most since they did so in eight consecutive contests from Sept. 1-8, 2010. Tigers manager Brad Ausmus won a pair of challenges. The first came in the third inning, when Altuve was ruled safe diving back into first base on a pickoff attempt. Ausmus prompted a manager's challenge, which overturned the call and wiped out a potential Astros threat. In the sixth, Jose Iglesias was called out at second on a stolen-base attempt, but he was quickly ruled safe after a short review. Tigers: Right-hander Anibal Sanchez takes the bump for Sunday's 2:10 p.m. ET rubber match at Minute Maid Park. Sanchez is 2-0 with a 3.38 ERA this season but has yet to finish six innings in either of his two outings. In his only start against Houston last season, he gave up seven runs on eight hits in 5 2/3 innings. Astros: The Astros will send right-hander Mike Fiers to the mound to close out their first homestand of the season at 1:10 p.m. CT on Sunday. In 11 starts for the Astros, Fiers has gone 2-2 with a 3.29 ERA.